Ah yes books the source of all knowledge, well no they’re not but they can help a little. 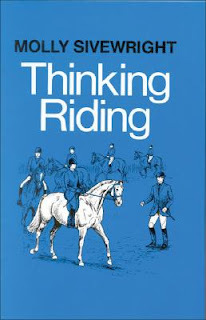 I have lots and lots of riding books and horse care books, today I will be talking about two of the most helpful ones, Thinking Riding by Molly Sivewright (ISBN 0-85131-321-3) this one is packed full of useful stuff to know, such as the rider’s seat, school work, riding out of doors, and lots more, now on to the next one. Thinking Riding book 2 In Good Form, (ISBN 0-85131-378-7) I like this one the most it has lots of interesting things, it has a very useful bit on the human skeleton it also has a bit on lateral movements and how to perform them, anyway books can be helpful, but I think I much prefer learning from experience rather then reading about it, but you should always do your research right.